Volcanos present a variety of hazards that should be considered when assessing risk. Cascade Volcanos can produce lahars (or debris flows mixed with water), pyroclastic flows of hot gasses and rocks, and ash fall that can range from a light dusting near the volcano to very heavy deposits that can bury soils and (rarely) collapse structures under heavy ash fall and pose a long distance threat to agriculture, water and sewer systems, navigation, aviation, and more. Due to the shear power of volcanic eruptions, risk reduction must begin with prudent land use planning. Risk is automaticly kept low if people and structures are kept out of harms way. Local development priorities often trump County and State land use and hazard mitigation planning efforts in Washington State where the State and Counties can largely only advise cities. Cities tend to want to expand to increase their tax base and attract new business making it difficult to reduce risk near volcanos. 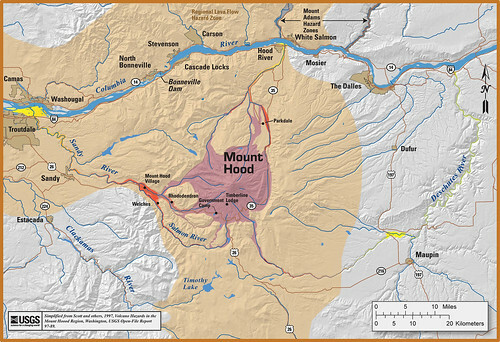 Scientists of the Cascade Volcano Observatory have produced composite hazard maps for the Cascade Volcanos to be published soon. CVO is also in the process of reorganizing and updating their web site and we will be linking to these and other products as they are published. Here are examples of Mt. Hood and Mt. 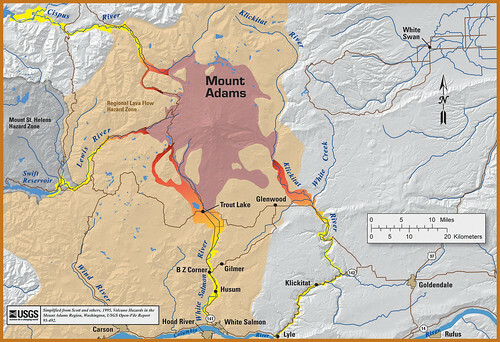 Adams hazard maps. 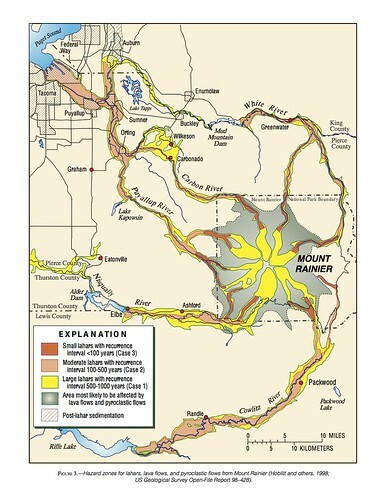 A lahar hazard map for Mt. Rainer follows.